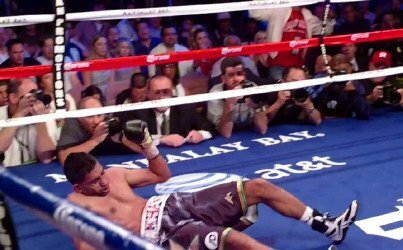 By Michael Collins: Right now there’s a lot of speculation about whether former IBF/WBC light welterweight champion Amir Khan (26-2, 18 KO’s) will be keeping his training Freddie Roach or giving him the boot and finding a new trainer for a fresh start. Khan has lost his last two fights and he can’t afford to lose another bout when he gets back in the ring in December if he wants to remain a television attraction. Khan has said recently that he wants his trainer Roach to be available to spend more time working with him instead of him having to wait to get Roach in between all the time he spends with his number #1 fighter Manny Pacquiao. It doesn’t look good for Khan in terms of getting his request. If he continues to schedule fights around the same time as Pacquiao, Khan is going to have to accept that he comes second. But nothing likely changes if Khan does decide to dump Roach because he’s not available when he wants him. Khan’s problems with his chin will continue on whether Roach is the guy or someone else is dug up to train Khan. The issue at hand is Khan’s ability to take hard shots. Roach can’t fix that problem and nor can another trainer. That’s just Khan’s build in limitations. Khan might be a little better if he dumps Roach and finds someone that can teach him to run, hold and use his jab without taking risks. Khan would have to find someone that can teach those skills while at the same time not pushing Khan to mix it up. Some trainers have a hard time with guys that need to be held back because of a chin problem. They tend to push their fighters too hard and this just causes them to suffer additional knockouts. What Khan needs is a trainer that is wise enough to know his limitations and then try and work around them. Emanuel Steward would be perfect for that, but I don’t know that Khan would be open to having him train him. Steward is a no nonsense type of trainer and there wouldn’t be the Hollywood atmosphere in his gym that there is in Roach’s Los Angeles based Wildcard Gym. Khan wouldn’t have the movies stars floating in and out of Steward’s gym like he does in Roach’s gym.